【Creat a Fine Living】Add a few drops essential oil to Soft Digits aroma diffuser,which brings nice fragrance to your room, perfect for creating a relaxed environment.It can for small bedrooms, hotel rooms, yoga room and even workplace cubicles. 【Better Sleep Helper】This ultrasonic diffusers is whisper-quiet when it is running. It will add essential moisture in your room, which provide night light while you sleep. Let you enjoy your sleep time. 【Smooth Colors Adjustable】7 adjustable LED color create a peaceful environment. You can sepcify a prefer color as a night light via press twice LIGHT button. If you want cycle light color, you can press once LIGHT button. 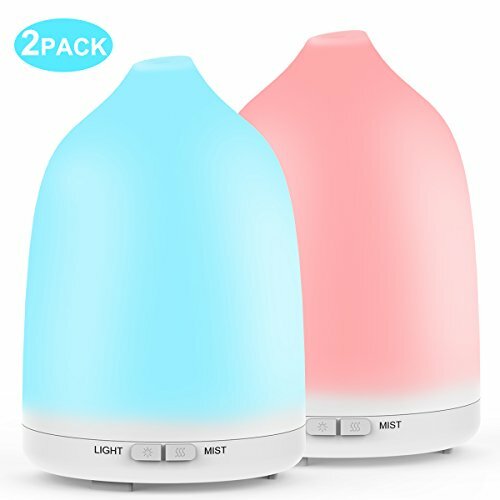 【100% Safe】Soft Digits essential oil diffuser is made from BPA PP material.When the water is run out, the diffuser will shut off automatically to protect the device. 【Notice & Warranty】It has adjustable two mist settings:continuously mode and intermittently mode. We offer 30 days money back and 12 month manufacturer warranty for our customer.